Create vivid, show-stopping posters, displays and signs with HP High-Gloss Photo Paper. This high-impact paper works with HP DesignJet CP printers and HP DesignJet Ink Systems to produce sharp, long-lasting color graphics that look, feel and perform like professional photo prints. 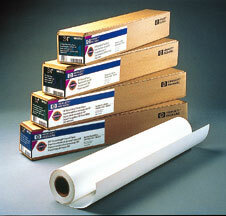 HP DESIGNJET HIGH GLOSS PHOTO PAPER 36 X 100FT. HP DESIGNJET HIGH GLOSS PHOTO PAPER 24 X 100FT.